Bureau Veritas (BV) has issued a new chapter in its rules providing a framework for electric and hybrid power solutions. The new class notations include power management (PM), power back-up (PB) and zero emission (ZE) standards. It is hoped that the notations will encourage wider uptake of energy storage systems (ESS) to provide operational and environmental benefits. According to Claudepierre, innovation has been led by the cruise and ferry sector, but wider adoption is being anticipated. Electric power provided by an ESS can be used when a ship is in port, during manoeuvring or alongside, to reduce or eliminate local air emissions when in proximity to centres of population or in emission control areas (ECAs). Furthermore, ESS can also provide peak shaving, power smoothing and power for DP (dynamic positioning) operations. “Obvious candidates for ESS are cruise ships with high hotel loads when in port, ferries with regular port visits and tugs with heavy peak load requirements. Ships with relatively short voyages making regular port calls could plug in to local power, enabling access to electricity from renewable energy sources as well,” added Claudepierre. 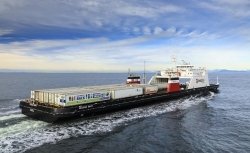 Seaspan’s two new ferries delivered this year also broke new ground by combining LNG propulsion with ESS. “We will see more of these hybrid solutions ordered and our new rules and notations will help ensure that these systems can be designed and operated safely and efficiently,” said Claudepierre.